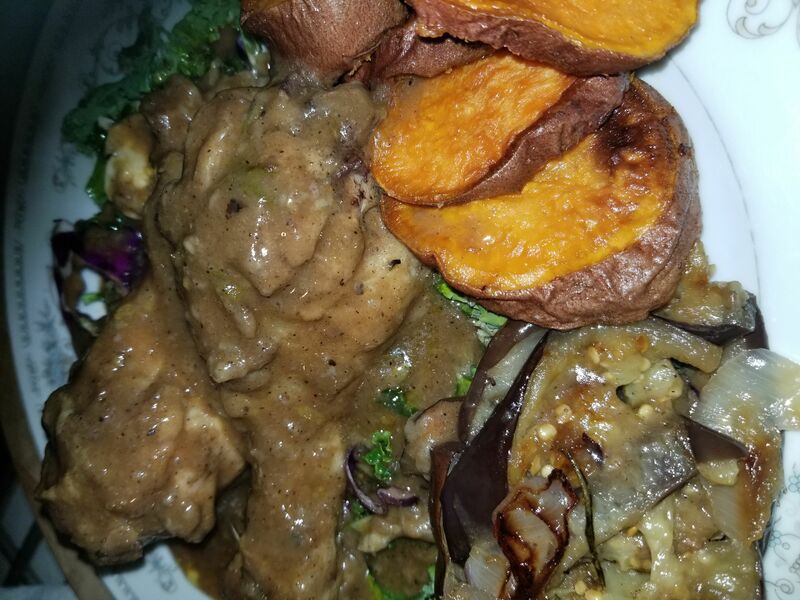 Chicken & Gravy with Roasted Eggplant & Candied Yams - $4 Cost per serving. 1 Hour prep time! These Ain't Your Mamas Candied Yams - Roasted Candied Yams - No Sugar. No Butter. These ain't your Mama's Yams. I love those classic candied yams, but the butter and sugar are no longer in my diet. Too many members of my family suffer from Diabetes. 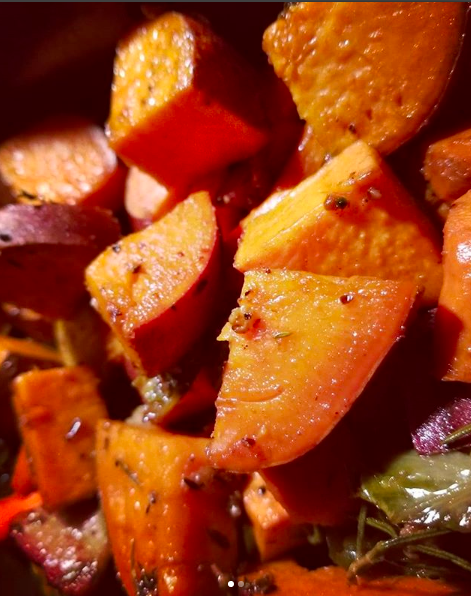 These heart-healthy yams are simply: Organic Yams, EVOO, Thyme, Rosemary, Jalapenos, 1/2 Slice Uncured Bacon (optional), Crushed Red Pepper, Cinnamon, Course Sea Salt and Onion Powder. Omit the bacon and make it Vegetarian and Vegan. Roasted at a high temp and the natural sugars caramelize. 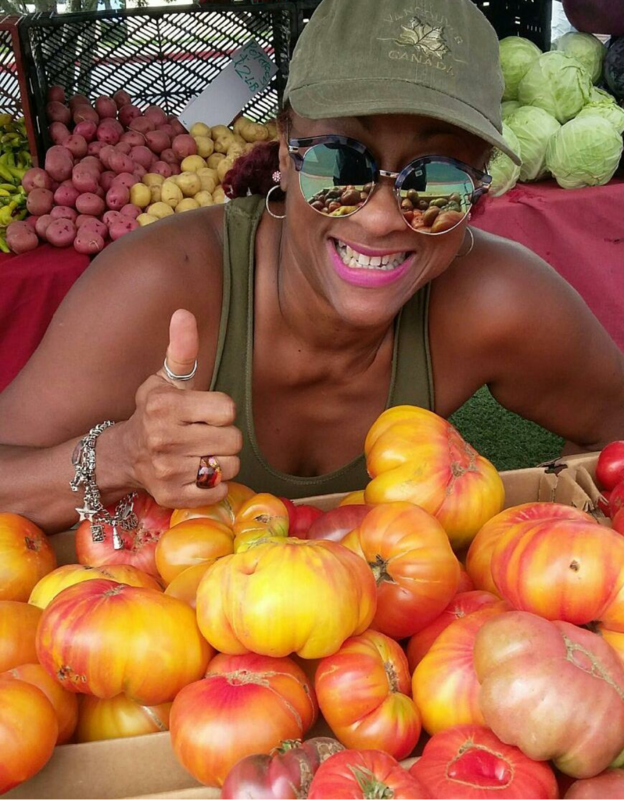 Beyond delicious and healthy. 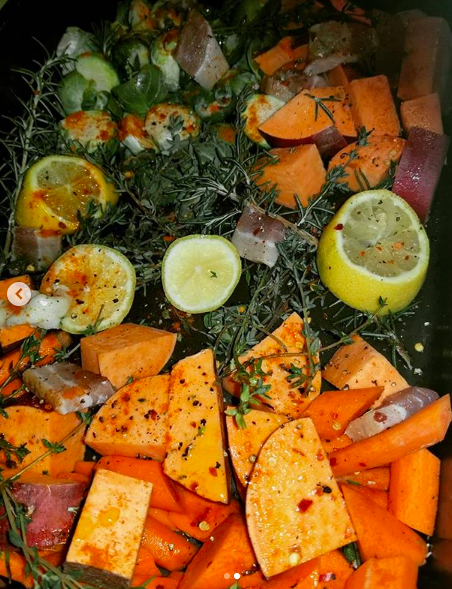 Roasting root veggies during the winter harvest is easy, quick and delish. Seasoned with organic herbs - Thyme and Rosemary, Coarse Himalayan Sea Salt, Cracked Pepper, Cayenne, Red Pepper Flakes, Jalapeno slices, Bacon and EVOO. This complete meal is a quick and low budget way to feed your family. Watch the Chicken & Gravy video recipe, I show you how to make a quick and easy chicken stock with no salt, and how to make an easy roux for gravy. Also, the secret to my These Ain't Your mama's Candied Yam and Roasted Eggplant.